Stanford Apartments are located in the heart of Downtown Delta Junction and a short walk from the Inn. Our 100% smoke-free newly remodeled efficiency apartments have brand new appliances and furniture. 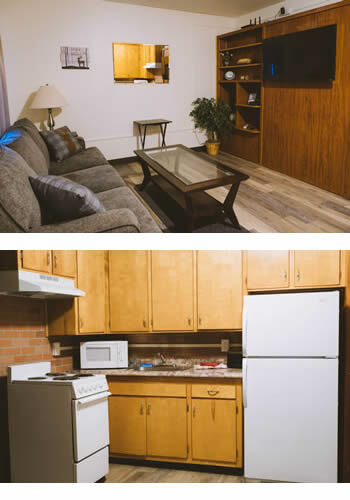 Every unit has a mid-sized refrigerator, mid-size d oven/range, microwave, toaster and coffee maker and comes fully-furnished with dishes, cookware, utensils and dish towels. Each apartment includes large flat screen TVs, cable and high-speed internet. These adorable units are great for short and/or long stays. A perfect home away from home.